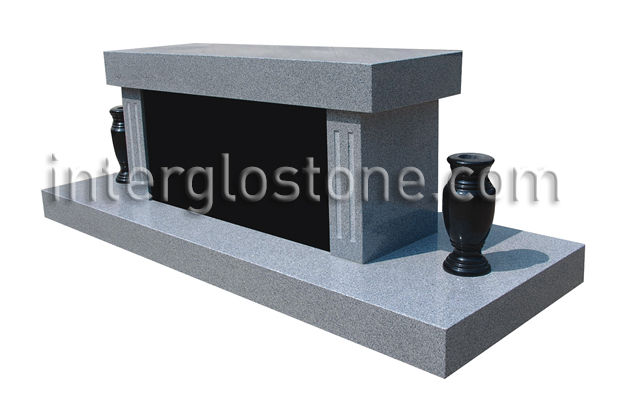 64" x 24" x 22"
30" x 9" x 14"
This large deluxe design–66″ x 24″ x 22″ high–features fluted column supports on each end and a large chamber (30″ x 9″ x 14″) which can hold up to four cremation urns. The large polished granite door covering the chamber can be removed for sandblasting or etching of names, dates and for placement of porcelain portraits. The front edge of the straight seat can be sandblasted with a family name , scripture or other text. The bench includes a large base for placement of flower vases.